ORANGE COUNTY, Texas – A wooden swing sways as the afternoon sun climbs to its peak. Adam Romero sits comfortably on his front porch as he rocks back and forth. He’s a stout man, 90 years old, with shaved white hair, dressed in overalls with a striped dress shirt and black Velcro shoes that aren’t laced. His wife of 22 years, Joyce, sits next to him in a foldable blue lawn chair. On a small table that separates them rests Adam’s beer—a non-alcoholic brew that he calls his Colorado Kool-Aid—and Joyce’s blue Gatorade, the bottle sweating. It’s October in Texas and the morning clouds give way to a toasty 93-degree sunny afternoon. Adam and Joyce Romero sit on a swing on the front porch of their home. The two don't go inside anymore because of mold, but Adam enjoys returning to the home he's owned for more than 50 years every day to be on his small piece of land. Adam doesn’t mind the heat. Frankly, there’s no place he’d rather be, despite of everything. Laid out in a pile in front of their home is everything they own: clothes, pots and pans, a washer and dryer, Joyce’s Elvis Presley records, the custom-made kitchen cabinets Adam built. Mold spores grow inside on the walls, ceiling fans and in the bedrooms and closets; small rusted nails poke through where the wooden floor used to be; the warm outside air seeps inside from the shattered windows. They’ve been told their home, which Adam has owned for 56 years, isn’t salvageable and must be demolished. The two are quiet on the porch. Joyce tears up when she talks about all they’ve lost. Adam is a man of few words, but his sullen face says what words don’t: At 90 and 71 years old, respectively, Adam and Joyce wonder how they’re going to start over with nothing. The two were forced to evacuate their home Aug. 30 when Hurricane Harvey moved east towards Beaumont and stalled, just as it did when it flooded the Greater Houston area. They didn’t evacuate early because they, like so many others, didn’t believe the hurricane would be so severe. They’d been through hurricanes before and had never seen the water reach their front porch. But the water kept rising from Caney Creek behind their home, creeping closer and closer. Adam, who has a touch of stubbornness, heeded Joyce’s warnings that they should evacuate before the water reached inside. “As long as it ain’t in my bedroom, I’m fine,” he told her. So they stayed. But not for long. The water seeped into their master bathroom and then into their bedroom. It was time to go. The water was three feet high outside. Their neighbor across the street, aware they were still home, waded through the water with a small pedal boat to get them to higher ground. Adam was rescued first while Joyce stacked their most important possessions on top of the bed, including her wooden box of Elvis memorabilia she had collected over the years. But nothing was more important, she thought, than Adam’s three accordions that he cherishes most. She grabbed them along with a bag of medicine. 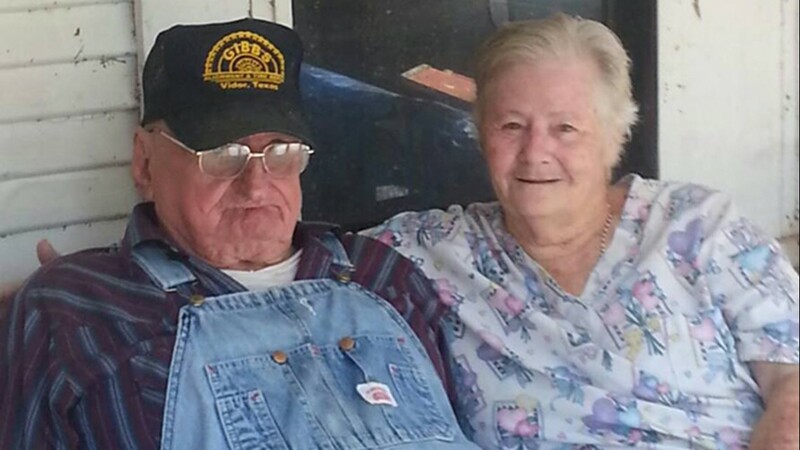 The two spent the night at their neighbor’s home before evacuating to DeRidder, La., to stay with Joyce’s daughter. Adam and Joyce Romero pose for one last photo after they made a final walk-through of their once-flooded home. Water rose nealry five feet inside Adam and Joyce Romero's home. Water begins to rise in Adam and Joyce Romero's front yard. The first signs of floodwater outside Adam and Joyce Romero's home. Water begins to creep up in Adam and Joyce Romero's yard. Water begins to rise outside Adam and Joyce Romero's home. The water begins to rise outside Adam and Joyce Romero's home. Flooding along Adam and Joyce Romero's street. Water rose nearly five feet inside their home (seen in the back). The water, though still high, begins to recede at Adam and Joyce Romero's home. The floodwaters begin to recede at Adam and Joyce Romero's home. Water rose nearly five feet inside their home. Mold growth inside a bedroom closet inside Adam and Joyce Romero's home. Gutted walls inside Adam and Joyce Romero's home. Exposed pipes inside Adam and Joyce Romero's home. The water rose nearly five feet inside Adam and Joyce Romero's home. Mold grows on the walls inside Adam and Joyce Romero's home. A pile of debris sits outside the front of Adam and Joyce Romero's home. A pile of Adam and Joyce Romero's flooded belongings. A pile of debris that sits in front of Adam and Joyce Romero's home. A sign in the pile of Adam and Joyce Romero's flooded belongings reads "Hope anchors the soul." Joyce Romero sorts through her flooded photo albums. Adam Romero sits on a swing on the front porch of his home as a large tarp blocks off the front door. Adam and Joyce Romero take a photo with the group of people who help remove all their flooded belongings from their homes. 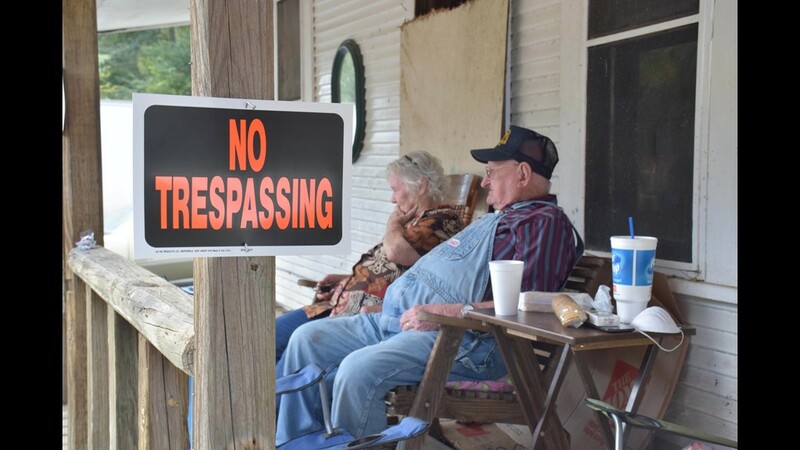 Adam and Joyce Romero sit on the front porch of their home. Joyce Romero holds a mask to her face as she stares at mold growing inside her home. Hurricane Harvey sent nearly five feet of water inside. A gutted bathroom in Adam and Romero's home. Adam and Joyce Romero's living room sits bare after Hurricane Harvey sent nearly five feet of water inside their home. The walls and floors have been ripped out of Adam and Joyce Romero's home after Hurricane Harvey sent nearly five feet of water inside. Mattresses laid out in the yard of Adam and Joyce Romero's home. The back door that Adam attempted to break into after he and Joyce returned home after Hurricane Harvey flooded their home. Nearly everything Adam and Joyce Romero owns is thrown into a pile in front of their home. Floodwaters overturned and destroyed everything in Adam's shed. A broken window allows the warm fall air into Joyce and Adam Romero's home. Hurricane Harvey sent nearly five feet of water inside. Lucretia "Stormy" Mcdonnell hangs a no tresspassing outside Joyce and Adam Romero's home. A dream catcher sits on a beam on the back porch of Joyce and Adam Romero's home. The Romero's statue of the Virgin Mary. Adam Romero sits on the front porch of his home with one of his accordions that were saved from the storm. Adam and Joyce Romero sit on a swing on the front porch of their home. Hurricane Harvey sent nearly five feet of floodwater inside their home during the height of the storm. One of Adam Romero's accordions. Socks, the neighborhood cat that Joyce Romero occasionally feeds. A flooded bucket sits under Adam and Joyce Romero's front porch. Adam Romero (right) sits and plays with Kip Coltrin, the founder of the Cajun Special Forces. The Cajun Special Forces is helping Adam and his wife, Joyce, recover after Hurricane Harvey sent nearly five feet of water inside their home. Adam Romero plays his accordion on the front porch of his home. Adam and Joyce Romero sitting on the front porch of their home. Floodwaters tipped over a shed outside Adam and Joyce Romero's home. Adam Romero (right), Lucretia Stormy Mcdonnell (front) and Kip Coltrin (left) talk on Adam's front porch. Every day since Sept. 18, the first day they could return to their home after Harvey, Adam and Joyce make the 73-mile journey from DeRidder back home so Adam can sit on his swing and be on his small piece of land. Some days they spend all day, Adam in his swing drinking his Colorado Kool-Aids with Joyce next to him; some days for just a few hours, long enough for Adam to see nothing has changed. Although there’s nothing they can do, being here helps Adam relax, Joyce says. In the weeks after evacuating when they couldn’t return, Adam developed a stress-induced knot below his right eye that had gone bloodshot. But as they returned each day to their home, Joyce noticed the knot grew smaller and Adam’s bloodshot eye began to clear. There are no signs of either now. “Do you want to play your accordion?” Joyce asks Adam as he swings on the porch. Adam doesn’t hear her the first time. Not only is he hard of hearing but he has COPD, a condition that affects one’s breathing, and Alzheimer’s, which he was diagnosed with in 2011. Joyce, too, suffers from COPD, and she’s a year removed from winning her battle against breast cancer. Adam grabs the wooden accordion from Joyce with his strong hands and thick fingers from his years of work as a carpenter. He sits up in his swing and rests the instrument on his knee. “She doesn’t play like she used to,” he says. 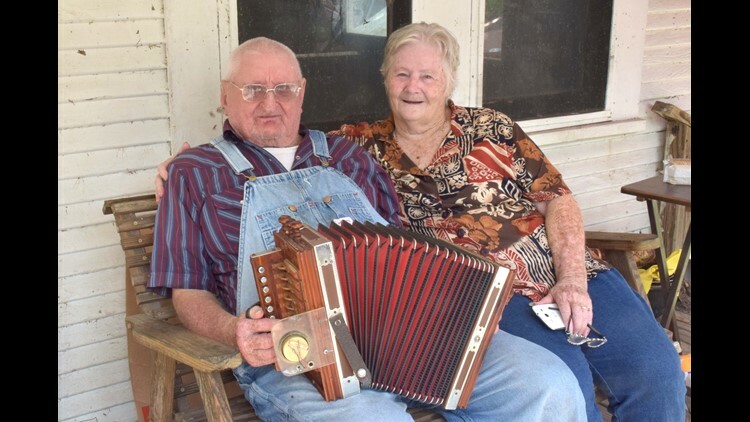 He favors French and Cajun music that he grew up on as a young boy in Youngsville, La. He plays Pistol Packin’ Mama and Bayou Pon Pon, songs that take him back to his heyday when he’d call an end to the workweek every Saturday at noon. He’d invite his family and friends to his home for an all-day barbecue of song and dance and party. The afternoons often bled into early Sunday morning, ending some 14 hours after the barbecue began. His mouth puckers when he plays. His upper body tightens and loosens as he stretches the bellows and pushes them back together. His feet tap to the music. The wood frame rests in his hands as his fingers push the silver keys that help the accordion sing. Adam and Joyce first met at the American Legion in Orange, Texas, in 1995. Adam was immediately smitten and followed Joyce around, telling her, “I’m gonna marry you.” Joyce, who was going through a divorce, told him, “No you aren’t. Not yet.” But Adam’s persistence paid off when Joyce invited him over for a beer. The two sat talking and eventually she asked him if he wanted to go to the courthouse to get a marriage license. At the time, Adam didn’t immediately understand her proposition. “It took awhile for it to dawn on him,” Joyce says. They were married Aug. 4, 1995, three months after their first meeting. They don’t know how long it’s going to take to rebuild or how they can afford to start new. They live on a fixed income of less than $1,600 a month, and when the bills and doctors’ visits are paid, there’s little left for other expenses—certainly not enough to build and furnish a new home. With the help of the Cajun Special Forces, a Louisiana organization that helps people affected by disasters, a demolition crew from Austin will later demolished their white-paneled home and all the work Adam had completed through the years: the extended dining room, the added-on front porch, the custom-built kitchen cabinets. Kerry McMichael, a volunteer with the organization, first met Adam and Joyce after they evacuated to Louisiana. She brought them blankets, clothes and food. Adam was upset he couldn’t pay her, so instead he played for her. She hopes to help them get a manufactured home that’s compliant with the American Disabilities Act for Adam. In the meantime, she hopes help them raise money and to secure a temporary trailer so they can return to live on their land. Adam sits back in his swing and sways back and forth. It’s late afternoon now and the sun has crept halfway up the patio and onto Adam’s legs. Still, he doesn’t seem to mind the heat. He sips his Colorado Kool-Aid, which at this point must be as warm as the afternoon air. Joyce sits in the blue lawn chair by his side. “I’ve been here a long, long time,” Adam says, breaking the silence. He takes another sip, continuing to swing. “It’s just devastating that we’ve lost everything. It’s hard to start all over,” Joyce says, tears filling her eyes. She says she's got to quit crying so much. “Are you ready?” she asks Adam. He’s not, but she is, and on this day she’s making the decision to leave. “Everybody is going home, Adam,” Joyce says walking to the truck as he still rocks in his swing. Begrudgingly he gets up. They climb in and pull out of their long, narrow street that once sat some six feet under water. The truck turns left and they leave the land that Adam hopes to one day return.